We help home & business owners succeed with our machines! 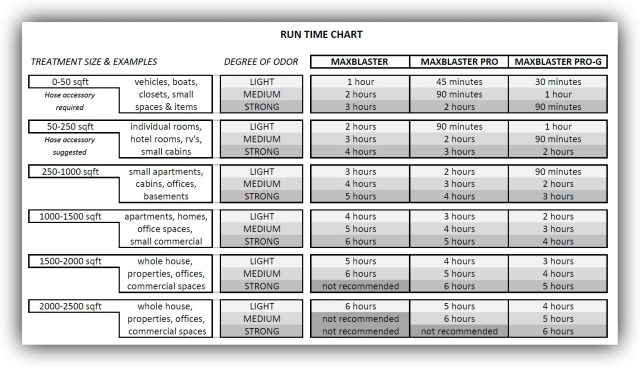 Request a printable version of our owners guides or see the Run Time Chart and Owners Guide (Extended Version) below. Questions? Contact us today for fast, friendly, expert advice. Disclaimer*: Use only in unoccupied spaces for high concentration ‘shock’ ozone treatments against organic odors & mold scent. Please read these operation instructions carefully to ensure maximum efficiency, effectiveness, and long-term value. If you cannot permanently remove the source of your odor it will be necessary to continually retreat the space as new odors develop. Our suggestion is to eliminate the source to the best of your abilities and then follow our instructions on ‘Blast & Maintenance Cycles’ (B9). After your initial ‘blast’ type treatment you can scale back the ‘maintenance’ treatments to shorter run times as you begin to notice odors redeveloping. 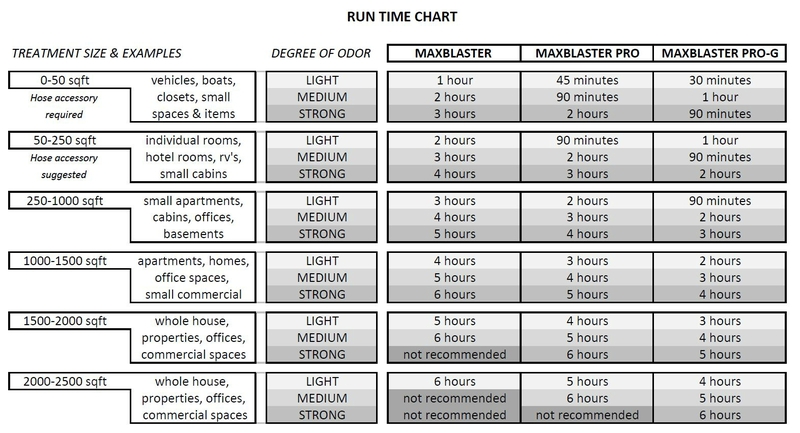 See section below ‘Blast & Maintenance Cycles’ (B9) for more information. Turn on as many fans (ex: household fans, ceiling fans, central air system, air movers) that you have easy access to across the treatment area to create an air pattern that allows for maximum ozone distribution. It is recommended to place at least one fan near the machine in the same air flow direction so that the ozone that is immediately coming out of the machine can be quickly picked up and spread more rapidly throughout the space. This also helps to minimize the amount of ozone being immediately recycled by the machine and in some cases can actually pull more oxygen through the machine thus creating more ozone. Is there any way to monitor the exact ozone levels to determine if it is safe to reoccupy the space? 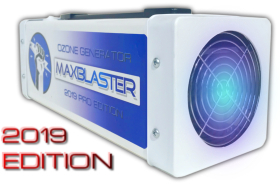 After using your MaxBlaster it is important to store it in the proper manner to prolong its lifespan and ensure long term value. If the machine turns on and you feel air passing through the machine yet you do not detect the buzzing sound, unique ozone scent, or the purple glowing lines from the plates within the machine there is a high probability that the generator pack (set of plates) has arced (failed) within the machine. If you notice one distinct spark coming from one of the plates and no purple glowing lines this is further confirmation that the generator pack has stopped producing ozone. There is no cause for alarm if you notice a spark coming from one of the plates however the machine should be immediately shut down for service. Use only in Unoccupied Spaces: High-Output ozone generator intended for use in Unoccupied Spaces Only. Exceeds EPA standards. Non-Medical Device: We do not promise to cure or prevent any diseases with use of our machines. Mold: Ozone Generators may neutralize mold however we do not guarantee elimination of all mold from your treatment space. Consult with a Professional: For health related projects please consult with a medical or certified professional prior to use. Specifications: The ratings for our machines are subjective in comparison with other similar ozone machines on the market. High-Voltage Electric Device: Use extreme caution when operating our machines especially when you are not present in room. Liability: Use at your own risk. We are not responsible for any damages as a result of use or misuse of our machines. Contact Us: If you have any questions or concerns regarding this manual or our machines contact us prior to use. Thank you for choosing us we greatly appreciate your business!